House and time at Malvern: No 4, 1910 - 1915. Died: 25 April 1918 aged 22 in Belgium. Killed in action near Wytschaete. Son of Frederick William and Helen Maud Furley (nee Haig), Sunbury, Canterbury. b. 1896. Middle Shell - VI. School Prefect. XI Football; XL Cricket. Champion Athlete. Cadet Officer. Great War, 2nd Lieutenant 3rd Batt. The Royal Scots. 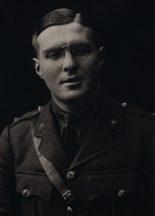 'Under normal conditions he would have gone up to Oriel College, Oxford, but in July 1915 he obtained a commission in the 3rd Battn. (Special Reserve) of The Royal Scots. He was sent to France in April 1916, and was for more than a year in the front line and fought all through the Battle of the Somme. On May 3rd, 1917, he was severely wounded at Monchy le Preux. He was mentioned in despatches (May 1917) and promoted Lieutenant in the following July.' Returning to France last March, he was reported missing on April 25th. The Army Council have since announced that they "were constrained to conclude" that he was killed in action on that date. He was an athlete of the true Public School type, generous, modest, unspoilt by success. As a Prefect he set himself a high standard, and gave of his best to his House and School. Of warm affections and full of good-will to all; he smiled his way through difficulties, and perhaps the only cloud which overcast the enjoyment of five happy years at Malvern was the fear that through weakness of eyesight he might be debarred from military service. Of his work in the war it is enough to say that he upheld to the full the traditions of the great regiment in which it was his pride to serve.' (Malvernian, Feb 1919). Previously wounded 3rd May, 1917, at Monchy-le-Preux, while attached to 2nd Bn.